A local rancher, Richard Holen, with no substantive connection to Beach or Nees, testified, (Tr. 316-355), that he left the American Legion bar at approximately 2:00 a.m. with his girlfriend. She had just finished her work shift at the bar. As he traveled on the highway outside of town, his vehicle came up behind the Nees’ truck turning into the riverside park where the murder subsequently occurred. Mr. Holen testified that the truck was readily identifiable as being owned by the Nees family. His headlights illuminating the cab, he observed a number of people riding in the truck, at least some he identified as being girls. As he returned to town, having driven the commonly traveled loop, popular among young people at the time, Mr. Holen then observed a second vehicle parked alongside the Nees truck. 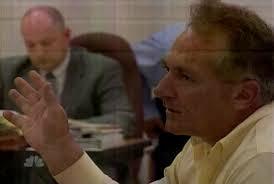 Richard Holen’s testimony puts numerous people at the crime scene shortly before the murder and contradicts Beach’s confession that he traveled alone with the victim in her vehicle and was alone with her when the murder occurred. The state maintains that Richard Holen’s testimony is not credible because he had been drinking and because he did not come forward with this information at the time of the murder or the trial. However, Richard Holen testified to the Board of Pardons and Parole that he did tell what he saw to police officer Steve Greyhawk (the same officer who broke into the evidence room) within days of the murder. Officer Greyhawk told him someone would get back to him regarding this information. Mr. Holen testified that no one from the police ever followed up on his information. Years later, when Barry Beach was charged with the crime, Mr. Holen discounted the significance of what he observed because he reasoned that the police had sufficient information to convict Barry Beach, his eyewitness notwithstanding. There are no eyewitnesses to Barry Beach being about town that night. Barry testified that, contrary to his confession, he was at home that night after an afternoon of heavy drinking and smoking marijuana. Barry’s sister corroborates his alibi. Barry’s sister was not called to testify in the original trial on the advice of defense counsel. She did testify before the Board of Pardons and Parole.